The Day is here... The uberly long awaited service pack for the Microsoft's best selling Operating System is just released. It has been years since MS launched its last service pack for XP but after years of regular updation they have finally compiled it as a bunch and readied it for release. Microsoft has just announced that it is going to resume SP3 updates whose release had been put on hold due to some conflicts of SP3 with Microsoft Dynamics Retail Management System program. But MS has said that release has been resumed for web downloads. 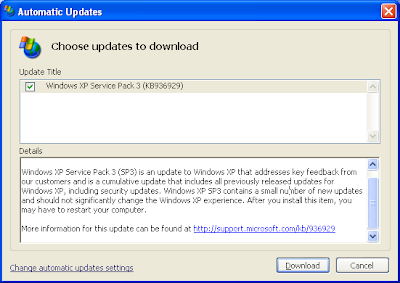 Here is the Official Windows XP service pack 3 Overview link .